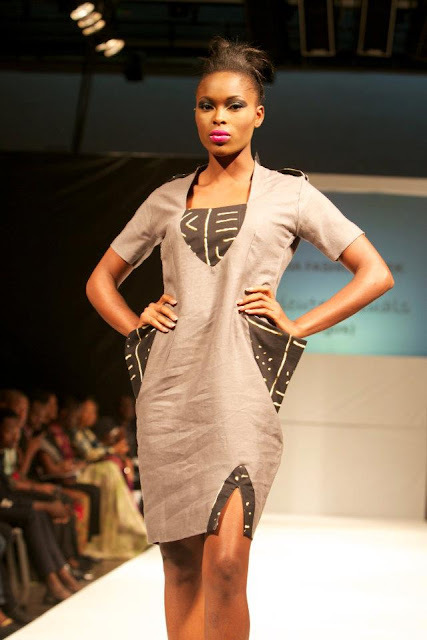 The Nigeria Fashion Week 2011 was concluded last weekend at the prestigious Muson Centre, Onikan Lagos. The epoch-making, three-day event was witnessed by fashion lovers who had gathered from all over the world to witness it.This year's edition, titled ' Going green' is a clarion call for people to have a rethink and work together to save the planet from poisonous gases emitting from nuclear energy sources into the atmosphere, destroying our planet. Addressing guests at the opening ceremony, President/CEO of Legendary Gold Limited, organisers of the event, Lexy Mojo-Eyes explained that the Nigeria Fashion Week is one of Africa's premier fashion events, which have attracted not just local designers but also international stake holders in the fashion industry. Speaking on the theme of this year's event, he told the audience to use the opportunity to have a re-think in the effort to salvage our threatened environment from total destruction. The Nigeria Fashion Week 2011 hosted two shows daily. The 1st show for 12 noon and the 2nd for 6pm with each beginning with a red carpet cocktail. The most amazing thing about each of the 6 shows is that they all started on time as promised by the organisers. Legendary Gold Limited is generally known to begin their events on schedule. Most importantly, each show recorded standing room only. This year’s event attracted lots of international media which included Fashion Tv, Paris, CNN, BBC, REAUTERS, Vice Tv from the UK, Italian Vogue, French Elle, British Cosmopolitan etc. The Nigeria Fashion Week is organized in collaboration with the Federal Ministry of Culture and Tourism and the World Fashion Organization. Labels: African Fashion, african fashion blogger, African fashion Pictures, African print., Black fashion, fashion show, fashion shows, Nigerian fashion week, NIGERIAN FASHION. It was a great fashion show for the year 2011. It shows that the Nigeria Fashion industry is growing at a very good rate. We will be looking forward to the 2012 Nigeria Fashion show.